Organic. Ancient grain. High in fibre. Source of protein and iron. Slow release energy. No added salt. No added sugar - contains naturally occurring sugars. 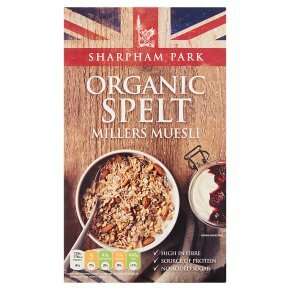 Vegetarian Society approved.Start your day with our Organic Spelt Millers Muesli, a mixture of all things yummy. The spelt's distinctive nutty almost, malty sweetness is enhanced by the raisins, dates and apricots and the combination of walnuts, almonds and sunflower seeds add a delicious crunchy texture - and did we say it's organic!